Megson comes out of the closet over Nolan, but Trotters fans don't wanna know. | NUFC Blog. Megson comes out of the closet over Nolan, but Trotters fans don’t wanna know. Megson confessing his desire for Nolan. Current Bolton Wanderers manager, Gary Megson, has come out of the closet and declared his desire for Kevin Nolan to make a return to the Trotters. Nolan had a long spell at the Lancashire club, spending some ten years there from 1999 to 2009, when he signed for Newcastle United in the January tranfer window. “It’s just an enquiry, we’ve asked someone to find out if Newcastle would be interested in loaning Kevin back to the football club and we haven’t had a response as yet. With Newcastle anxious to slash wages in line with their much reduced income in the Championship though, and Nolan currently on a contract which pays over £40,000 per week, we may not have heard the last of the Nolan saga yet. Megson wants Christmas Carroll at Bolton. They may not rate him but the irony is, that he’s come back into some sort of form. Megson was happy to take £4m when he saw Nolan’s fitness and form was on the slide. Now that there’s an improvement he wants him back for nowt? Cheeky get has managed to p**s off both lots of fans. Good effort. 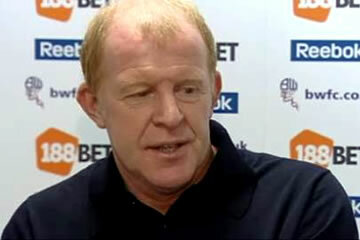 I think that it may be Megson’s feeble and misguided attempt to appease Bolton fans. Personally I don’t think he would return to The Reebok anyway, not even for a month’s loan. I know he’s not exactly Mr Popular in Bolton, but quite a few Bolton fans were sure they were going to get relegated when he took over from big Sam and little Sam. Whatever his faults, fair play to him that he’s still there, battling away. looks like someone left those kiddie hackers alone with the computer again. will rich parents never learn?